Some retirement homes in Fargo are “not to be messed with” due to suspicious gang activities. Fargo, ND – Apparently residents of opposing retirement homes in the Fargo area have been flashing gang signs back and forth at each other to the point where it has become “problematical”. 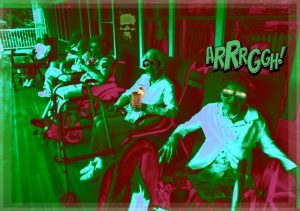 Police reports indicate that residents of Death Valley Retirement Home have been ramping up tensions between themselves and their opposition gang which resides at Purgatory Senior Living. “We’re not sure how this whole thing got started but we do know it cannot keep on escalating like it has been without a bloody full-blown gang fight breaking out sometime soon,” offers Police officer Lt. Greg Greeno, who’s been assigned to this case. Retirement home managers are considering searching resident rooms in search of weapons that could be used in a gang fight such as wooden spoons, rolled up newspapers, and even toothbrushes. For now, you are being asked to stay away from Death Valley Retirement Home as well as Purgatory Senior Living until tensions can be ratcheted down a bit. If you are going to visit a loved one who happens to be a gang member at one of these retirement homes, please pay attention to any gang signs you observe during your visit and report them immediately to the authorities.